Through her exploration of cinematic techniques and her intense experimentations with both digital and analogue technologies, Emmanuelle Nègre deconstructs approaches to the moving image, to produce immersive light works that expose the effects and the techniques behind the phenomena and magic of cinema. Emmanuelle Nègre is born in France in 1986 and studied at the Villa Arson School of fine Art. She got the DNSEP (Diplôme National Superieur d’Expression Plastique) in 2010. Emmanuelle has participated in local and international exhibitions and in 2011 she became a co-director of Catalyst Arts, Belfast. She is currently a resident of La Station, Nice. Edible mushrooms are grown and harvested to create 16mm sound films and derivative materials – collectively known as the SPORE PRINT FILM SERIES. This series is a study of organic, modern and contemporary technologies that explore cycles of creation, destruction and archival permanence. Mushroom spores (their reproductive unit) are placed on film (a reproductive unit) to produce an audiovisual loop. As the projector loops the film, playing its deteriorating images and sounds, the film is digitally recorded and then archived. Like fingerprints, no two spore prints are exactly alike. Along with color, smell and other physical markers, they are used as a testing mechanism for field identification. Hundreds of individual mushroom spore prints make up each film (and billions of spores comprise each print) – each with their own unique shape and coloring. During projection kinetic forces disperse the spores – accentuating and de-saturating the films’ colors and sounds. These colors, shapes and sounds are only palpable, like the spores themselves, when experienced en masse. Each of the films in the series features different audiovisual movements provided by different mushroom species. As they are played, a maelstrom of slowly-shifting-shapes is produced where form is in constant flux. *This project is funded in part by the New York State Council on the Arts and the ARTS Council of the Southern Finger Lakes’ Electronic Media and Film Finishing Funds. Anna Scime is an interdisciplinary artist currently living and working between Buffalo and Brooklyn, New York. Her work has been exhibited at film and art festivals, galleries and museums, including Burchfield Penney Art Center (Buffalo), Detroit Independent Film Festival (Detroit), Berlin International Directors Lounge (Berlin), PS1 MoMA (NYC), FLORA ars+natura (Bogotá) and others. She has received awards for her work including fellowships from the Liberace Foundation, the Center for the Moving Image, the Robert and Carol Morris Fund for Artistic Expression and Performing Arts, the ARTS Council of the Southern Finger Lakes and the New York State Council on the Arts. Hinton’s work explores notions of light and shadow and their associations with presence and materiality. Does a shadow indicate an absence or a lack? A void filled with nothingness? Or is it the opposite, rooted in materiality? Is the shadow a double, a copy, or can it exist as its own entity? For this body of work Beyond a Shadow of a Form, the artist combines elements of cinema, sculpture and installation to project complex shadows of three-dimensional forms that affirm their own material qualities. Exploring installation, film/video, performance, sculpture, drawing, printmaking and collage, Layne Hinton is a multi-disciplinary artist. She was raised in a small family of artists in a converted church-house in the middle of nowhere surrounded by fields in rural Ontario; an upbringing which informs much of her work. Hinton holds a BFA from OCAD University in Integrated Media, with a minor in Printmaking. She has received awards including the InterAccess Prize, OCADU Printmaking Award, OCADU Faculty Film/Video Scholarship, and O’Born Contemporary Best In Show for Romanticism Now. Hinton’s work has been shown at the Art Gallery of Ontario, YYZ Artist’s Outlet, O’Born Contemporary, L’École des Beaux Arts Paris and the Hermitage Museum, St. Petersburg Russia. She recently completed a solo exhibition at InterAccess Electronic and Media Arts Centre and is co-curator of Art Spin in Toronto. Cymatic Sun is an installation piece that translates sound into a visual experience using the kinetic properties of water. A large parabolic mirror, acting as both vessel and optic, is filled with water and seated in the cone of a speaker playing audible and subsonic frequencies. These sound waves propagate through the water to form cymatic patterns that, when illuminated, refract light to create real-time projections. Distinct Faraday waves are visible when playing particular harmonies while dissonant tones turn the imagery into a blur of motion and scattered light. Cymatic oscillations of water function similarly to the fluid surface of our sun, which vibrates with its own acoustic energy. Lachlan Turczan is an artist from Los Angeles working with natural phenomena. Much of his work seeks to overcome the separation of art forms in favor of an interdisciplinary approach. With a focus on the fundamental properties of materials, he presents complex systems by integrating tools. The relations formed between these mediums create novel experiences that present the familiar world in unfamiliar ways. His aim is to provoke a deeper curiosity in nature and our process of perception by posing alternative modes of seeing and hearing.He was trained as a painter and filmmaker at the Los Angeles County High School for the Arts and is currently enrolled at the Rhode Island School of Design. A glimpse at the mutual curiosity and suspicion between humans and animals. This piece features the white tailed deer of Fire Island, where they have no natural predators and are habituated to living with and being monitored by humans. ISLAND ARCADIA celebrates the beauty of the deer and the island while exploring the notion of wildlife, and wondering what wildlife thinks of us. The deer are crepuscular animals, and the music is inspired by the idea of a life experienced mainly at dawn and dusk. Emilie Lundstrøm is a Danish visual artist currently living & working in New York City. She has a Masters from ICP-Bard’s Program in Advanced Photographic Studies, and studied fine art photography at the Glasgow School of Art (BFA). Emilie is interested in the the transformations and cycles of the natural world, and their confrontations with “civilization”. Her MFA show, Imago (International Center of Photography, NY, 2014), was inspired by silk worms, incorporating photography, cyanotype on silk, and video installation. She has exhibited at the Charlottenborg Kunsthal – Spring Exhibition (Copenhagen, 2011), Copenhagen Photography Festival (2012), Royal Scottish Academy – New Contemporary Exhibition (Edinburgh, 2012), Rising Water: Photographs of Hurricane Sandy (Governors Island, NY, 2013), and elsewhere. Hunter Simpson is a musician & composer, originally from North Carolina, now living in New York. He has released two records and toured nationally under the name Daytona. He works as a consultant to foreign book publishers, and once appeared, albeit very briefly, on Law & Order: Special Victims Unit (Season 14, Episode 21). Dreamscapes of a cross country road trip, relieving the american dream. A multi-projector film/sound loop performance whose loops articulate and deconstruct our American Dream in projected (and therefore, architectural) space. The performance activates and reworks the tremulous relationship between moments of the mundane, monumental, and material, all filmed during a road trip made across the United States. Charlotte Taylor is an experimental animator, teaching Film/Video in the rural mountains of Western North Carolina. Her research ranges from handmade film and digital animation to optical toys and expanded cinema, and she is particularly interested in alternative forms of production and presentation. Her work has screened at venues across the world, including: Ann Arbor Film Festival, Indie Grits Festival, Strange Beauty Film Festival, TIE, EFF Portland, FLEX Fest, and the Anthology Film Archives. She was the recipient of the 2012 Helen Hill Award from Indie Grits, for her film “The Edge of Summer”. She enjoys organizing and teaching community filmmaking workshops for kids and at risk youth and is the co-founder/co-director of the Mechanical Eye Microcinema in Asheville, NC. She is currently working on a direct animation music video and an animated 16mm essay film about women in Belegarth medieval combat. Yay for film!!! Robert Edmonson received his BA in Film and Media Studies at the University of Florida. He currently serves as editor of OtherZine, a biannual film/essay publication from Craig Baldwin’s OTHER CINEMA in San Francisco. He creates films and videos that critique their own praxis while attempting to unpack everything from political economies to cultural commodities, from social architectures to gendered gestures, and the multiple intersections therein. He lives in Sacramento, CA. CHIRATSUKI is a collaborative composition for three slide projectors, abstract percussion and melodic electronics. Chiratsuki literally means “flickering” in Japanese. Fitting for the Mono No Aware VIII, yet it is also relevant in that this performance will make use of still images being manipulated into abstract light and color patterns using out-of-focus projection, as well as jittered electro-acoustic sound depicting the deconstruction of melody into texture, stories into graves made of rubble and dust. Tomonari Nishikawa is an artist and filmmaker, mainly working with a celluloid medium to make moving images for single projection, as well as expanded cinema works, including film/video installations, multiple-projection film, and film performance. Sontag Shogun is a collaborative trio that makes use of analog sound treatments and nostalgic solo piano compositions in harmony to depict abstract places in our memory. Textures built from organic materials such as sand, slate, boiling water, brush and dried leaves, both produced live in performance and recorded to weathered 1/4″ tape warm up the space between lush piano themes. All of which is abstracted coolly in the reflective digital space of treated vocals and a live-processed feed from the piano. Bringing us back, like a faded passing scent or any natural emotive trigger, but to where? The wordless journey there is sometimes inevitably more revealing than the destination itself. *As its name implies, the Technicolor (TM) dye-transfer color process (1929-1977; 1997-2002) literally involved transferring subtractive dyes (cyan, magenta, yellow) in succession and in careful registration onto a single-strand print stock. Walter Forsberg (b. Saskatchewan, 1980) works with time-based media as an artist and archivist. He is a contributing editor to INCITE Journal of Experimental Media. John Klacsmann (b. Augusta, Georgia, 1985) is Archivist at Anthology Film Archives in New York City where he preserves films of the American avant-garde. In the past he has worked as: a fireworks salesman, a computer programmer, a Class-D FM radio DJ, a Technicolor archivist, and a film laboratory technician. He currently runs a tiny tape label, ZAP Cassettes, and volunteers as a 16mm projectionist at Spectacle Theater in Brooklyn. Stewey Decimal (aka Alex Mallis) is a professional disc jockey and filmmaker. He grew up listening to rap music and spins a mix of disco/boggie/house and classic beats. As director of photography, he shot Keith Miller’s WELCOME TO PINE HILL (Grand Jury, Slamdance 2012) and FIVE STAR (Best Editing, Tribeca 2014). Alex directed the forthcoming short LA NOCHE BUENA, which he shot in Cuba. He is an MFA candidate for Integrated Media Arts at Hunter College (CUNY) and an active member of the Brooklyn Filmmakers Collective, the Meerkat Media Collective and instructor with MONO NO AWARE. The first installment of the FourMats series, this multi-media installation uses four formats to compose a single image of the Kodak building in Rochester, NY. Using discontinued color-reversal film stocks in 16mm, Super 8 and slide film, along with HD video, this looping installation documents the final days of the Kodak empire. End of Empire is both an homage to Warhol’s 1964 durational film, Empire, and an elegy to Kodak in the final days of the industry. Tara Merenda Nelson is a filmmaker, curator and installation artist. Her work has been exhibited in galleries, museums basements and backyards throughout the United States and Canada, including the Toronto 8Fest, Antimatter Film Festival, Anthology Film Archives and the Museum of Modern Art. In 2011 she curated a US tour for French experimental filmmaker Rose Lowder. She holds an MFA from MassArt and is currently an Adjunct Instructor at the University of Rochester and the Visiting Artist in Moving Image at the Visual Studies Workshop in Rochester, NY. Gordon Nelson is a Scottish-born artist who grew up in Western Pennsylvania, USA. His films have been screened in many venues, including Anthology Film Archives and the Andy Warhol Museum. He has taught filmmaking classes at MassArt and Pittsburgh Filmmakers and curated programs at the Museum of Modern Art (NYC) and the Carnegie Museum of Art. 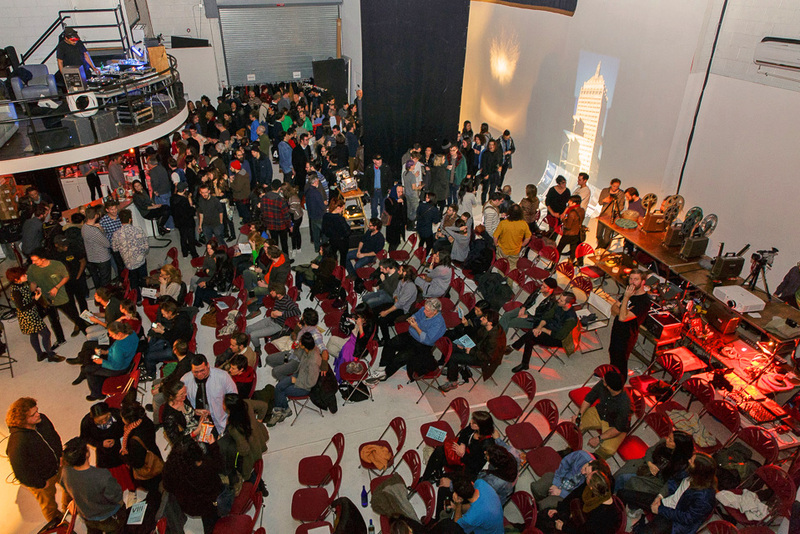 He is also a co-founder of Jefferson Presents, a microcinema collective with over 100 independent screenings. Minus plus equals the integration of different shapes, which transform themselves while becoming one and many. This is a handmade 16mm dual projection that explores the negative and positive spaces as well as the reuse of residual film material, which will eventually turn into underwater particles. Originally from São Paulo, Brazil, Lívia Santos moved to San Francisco in 2007 at the age of 18. There she graduated in Cinema Production and also studied photography while working with many different photographers and independent filmmakers. In 2013 Livia moved to Brooklyn, New York, where she is currently attending the Media Studies Masters program at The New School, while working as a freelancer. Livia has been deepening her practices and interests towards documentary, cinematography, as well as experimental filmmaking, and has been working on different projects that go beyond the conventional approach to cinema. She is interested in film performance and in altering the viewer’s perception while stimulating different senses. Livia is also extremely passionate for performance and body arts and enjoys collaborating with artists who use the body as a language. Andrei Moyssiadis is a Brazilian filmmaker and music producer based in São Paulo. In 2009 Andrei graduated from SENAC in audio and visual studies and has been working as a freelancer since then. Dream Seed is a sound bath hosted by members of Golden Drum and Didge Project. Shamanic chanting, mantras, overtone singing, Native American songs, indigenous music, didgeridoos, crystal singing bowls, bells, gongs, harmoniums, tuning forks and other overtone-emitting instruments are used to create an environment conducive to deep relaxation and inward investigation. Participants are led through guided meditations and sound healing practices designed to harmonize body, mind and spirit. Ink is lifted directly from the page (128 pages) in a physical adaptation of Victorian Frames, Borders and Cuts, published by the Dover Pictorial Archive; a study in embellishment from the 1882 type catalog of George Bruce’s Son and Company. Scott Fitzpatrick is a visual artist (Libra) from YWG, whose film and video work has screened at underground festivals and marginalized venues worldwide. He studied film theory and production at the University of Manitoba, and began conducting lo-fi moving image experiments in 2010. Primarily a filmmaker, also invested in photography, re-photography, kaleidoscope and collage. In the Spring and Summer of this year Sam Hoolihan and John Marks explored Minneapolis with Bolex 16mm cameras, each capturing unique perspectives on the cities’ transportation systems, pedestrian life, green spaces, and industrial textures. Projected as a triptych with an original, live mixed and processed cassette tape loop sound collage composed of both field recordings and synthesized sounds, City 3 plays off of the indeterminate compositional possibilities of asynchronous sounds and images. Hoolihan and Marks chose to work on new and expired Kodak Tri X, Plus X, Hi-Con 7363, and Ektachrome film stocks, all of which were hand processed at MirroLab, a Twin Cities photochemical film lab and project space, founded by the artists. Mono No Aware VIII is the New York premiere of City 3. Sam Hoolihan is a Minneapolis-based visual artist and teacher blending photography, film/video, and performance. His films have screened in Chicago, San Francisco, and Los Angeles. Sam has been a resident artist at Elsewhere Artist Collaborative in Greensboro, North Carolina, and Art of This Gallery in Minneapolis, MN. He is co-founder of MirrorLab, a studio, film lab, and project space for explorations in integrated art forms. 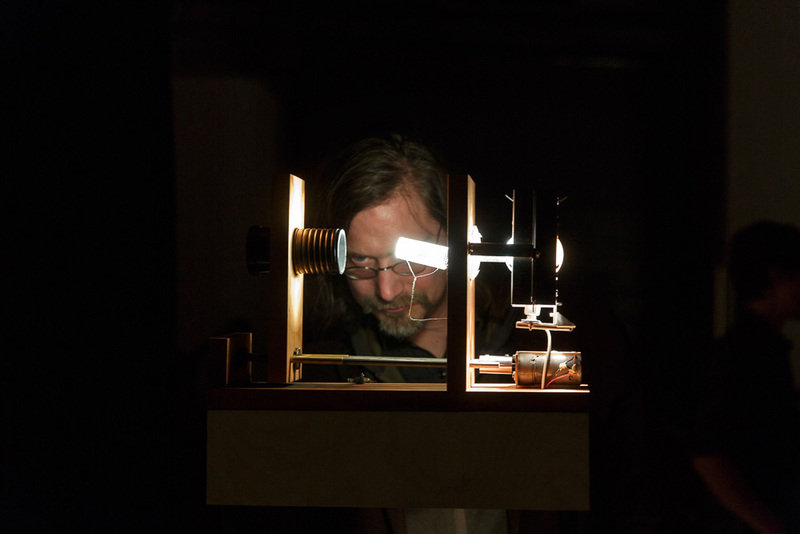 Sam is currently teaching handmade/analog cinema at both MCAD and the University of Minnesota in 2014. A mermaid-like figure is seen emerging from the waters transforming into a human. With her new found limbs she explores her surroundings with a curiosity and strong desire to be the ideal self. The film further delves into the possibilities of change and displacement as the figures identity slowly unravels..
Brian Oh was born in Illinois, USA, raised in South Korea and spent time living in Germany as a teenager. Dropping out of college in South Korea, he moved to Chicago to pursue his film studies at the School of the Art Institute of Chicago. Soon after graduating from the school, he moved to New York City and has worked on several short films, documentary, music videos and multi-media projects and shown his works to several screenings, exhibitions and public press. Influenced by his nomadic childhood, his work is personal with an emphasis on the psychological process of an artist and elements of the subconscious duality and origin. Maya Kuroki is a musician, performer, director and visual artist who is active in Montreal. After 2 years of TOHO GAKUEN theatre university, and 5 years of performing in the HAIYUZA theatre company, as well as participating in many independent productions as a professional actor in Tokyo, Japan, Maya Kuroki explored the world for 2 years. She “put a stone” in Montreal, devoting herself to music composition, performance, painting, writing and looking for treasures in garbage. She established the band DYNAMO COLEOPTERA, which offers not only experimental rock in Japanese, French and English, but also theatrical performances (This project was given long-term guidance by MAI (Montréal, arts interculturels) in 2008, received 1st prize at Mon Accèse à la Scène, 2007, and was awarded a grant from Conseil des Arts et des Letters du Québec). Kuroki continues to compose and perform throughout Quebec, looking for a world without frontiers in all kinds of objects. Another piece she collaborated on was “Haunted Womb Tour” (Late Production), remounted in 2009, that had received a prize from Tangente at Montreal’s Fringe Festival, 2007. Alexis Farand is an accomplished Foley artist and drummer based in Montreal. Memo is my color first film stock, I made for remind myself about the truth of changing, it is a certain thing. Krittin Patkuldilok is a filmmaker based in New York. Originally from Bangkok, Thailand. He’s interested in the interpretation of the meaning of life and the Buddhism’s philosophy. Hoshika Tachibana was born in Japan in 1988, left for Singapore at the age of 5 and has lived in 5 countries since then (Japan, Singapore, Malaysia, South Korea, U.S.) Fluent in English, Japanese, and Mandarin Chinese. Worked as a translator and interpreter for around 3 years. Currently working at the UN at the Department of Public Information. Aleksandra Kocheva’s musical studies began at age 5 in her native Bulgaria. While the classical piano training she received in Bulgaria was of the highest quality, she laments that the political, cultural, and economic climate there means there is no opportunity for musicians once they graduate school. Strongly committed to pursuing her life’s passion, she has made many great sacrifices to continue a life of music. After completing her bachelor degree in piano performance, Aleksandra left her homeland to study music in Europe, also leaving her friends and family behind. While in Germany, she released her first recording “Ad Libitum”, funded by the Soros and Pro Helvetica foundations, with her twin sister Nikoleta. It was also there that she received the prestigious Erasmus award from the European Union for outstanding musical performance, but this was only the beginning of her musical journey. Aleksandra has continued a life of growing as a musician, and performing. She has played at Carnegie Hall, Steinway Hall, Merkin Hall, and has premiered many works by well known composers including Milton Babbitt. 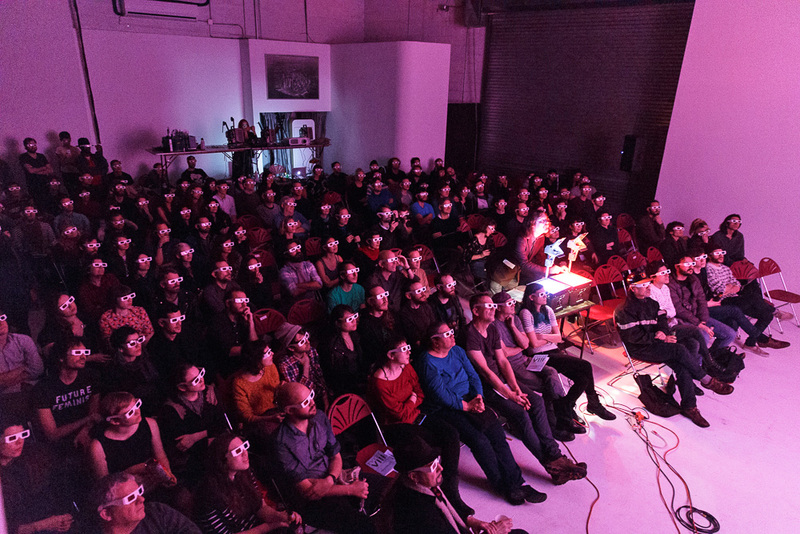 SURFACE COPERNICUS, an expanded cinema piece, involves the projection of four super 8 films simultaneously, though displayed separately as the four quadrants of a larger square. Each quadrant, devoted to one of the four primary figures of the Copernican Revolution (Copernicus, Kepler, Galileo, Newton) exhibits the qualities, movements and meanings associated with each figure’s work. The pulsating shapes and colors of the visual component, buoyant and tidal, remain anchored to a musical composition developed according to the principles (mathematical, geometrical, natural) of the early astronomers. The harmonic moods generated are based on a variation on Pythagorean tuning and the timbres are derived from recordings of plucked strings, a common illustrative tool in early approaches to cyclical motion as in astronomy. This soundtrack, designed using MaxMSP, will be manipulated anew for the performance. As a work of retroflection, Surface Copernicus attempts to simulate the nebulous spirit and fluid generosities inherent to what occurred centuries ago, as well as stimulate a reorientation toward that which seems always already underway. Our intuition and intention is presented here, however humbly, through a set of devices quite similar to those of the medieval adepts: glass lenses, a catalogue of lights, numerical calculations, and vibratory frequencies all magnetized and maneuvering under an unmanageable darkness. For film has its own allegiances, and is subject to intimate processes that determine the manner in which light exposes. The infinite macroscopic universe, though privileged as the object of the camera, must render its prestige to a microscopic order whose chemical pieties are imperceptible and uncontrollable. Patrick Scanlon studies writing teaching at BMCC, and Columbia University’s Teachers College in New York City. He received an MFA in Writing and Poetics from Naropa University’s Jack Kerouac School, and an MST in Education from LeMoyne College. Currently a PhD candidate at Teachers College, he considers—through poetry, performance, video—the ways in which attention is, and comes to be, composed. His most recent work appears in The Encyclopedia Project, and the journal in interruption, which he edits with Vinny Brown. Kyle Corea was born and raised in Rochester, New York, and works primarily in 16mm and Super 8mm. He received his BFA in Film-Art at Syracuse University, and 2006 he co-founded Syracuse Experimental: a grassroots cooperative dedicated to the growth and preservation of alternative, first person cinema and media. Currently living and working in Brooklyn where he enjoys collaborating with other artists and musicians, focused on exploring forms of documentary and poetics within the analog realm. Stone Dow is a documentary filmmaker hailing from Cape Cod, Massachusetts. He has co-directed four experimental films, with Kyle Corea, that were featured at a series of One-Take Super 8 Festivals in Syracuse, New York. He is currently in post-production on a feature-length documentary about former fashion model and Warhol superstar, Ivy Nicholson. He graduated Syracuse University with a degree in Television, Radio, and Film in 2006 and now calls Brooklyn, New York his home. Clint Hartzell is a musician, programmer and linguist from Camden, Maine. He began working with digital audio at Syracuse University for live performance, audio analysis, and building programmable software instruments. While working with computational approaches to generative grammar as a graduate student in linguistics at UMass Amherst he began designing tools for algorithmic music composition in the programming environment MaxMSP. He has performed with groups throughout New England and New York since 2002. A projection performance in anaglyph 3D for two overhead projectors, with Victrola soundtrack. The Goddess enters the red chamber and views the phases of the moon. Joel Schlemowitz is an experimental filmmaker based in Brooklyn, NY. Screenings of his films have included the Ann Arbor Film Festival, New York Film Festival, and Tribeca Film Festival. His work has received awards from the Chicago Underground Film Festival, The Dallas Video Festival, and elsewhere. Shows of installation artworks include Anthology Film Archives, Mono No Aware, and Microscope Gallery. He teaches filmmaking at The New School in New York. The third work in the continuing series of expanded cinema performances exploring the hermeneutical process as it might be applied to cinema and technology. In this entry, the 1 text-based filmic image is overlaid with a digital video projection that is controlled by custom software. The hybrid moving image is re-interpreted by the computer to control immersive audio synthesis. The viewer is questioned about her relationship to history, meaning-making, and cinematic experience. Michael A. Morris is an artist and educator based in Dallas, Texas. He works primarily with film, video, and expanded cinematic forms. Much of this work responds to the rapid changes in how moving images are experienced in the 21st century and how media affects how we understand perception, history, mortality, and our relationships to others. Morris has performed and screened his films and videos at museums, galleries, microcinemas, and film festivals internationally, including recent performances at Winnipeg Underground Film Festival, Experimental Film Festival Portland, and the Boulder Museum of Contemporary Art. His recent expanded film Second Hermeneutic was awarded Best Expanded Cinema at Milwaukee Underground Film Festival. He teaches new media and video art at several colleges and universities around the Dallas area.